It’s time to sign up for the program and make your first of three Holiday Heroes donations! 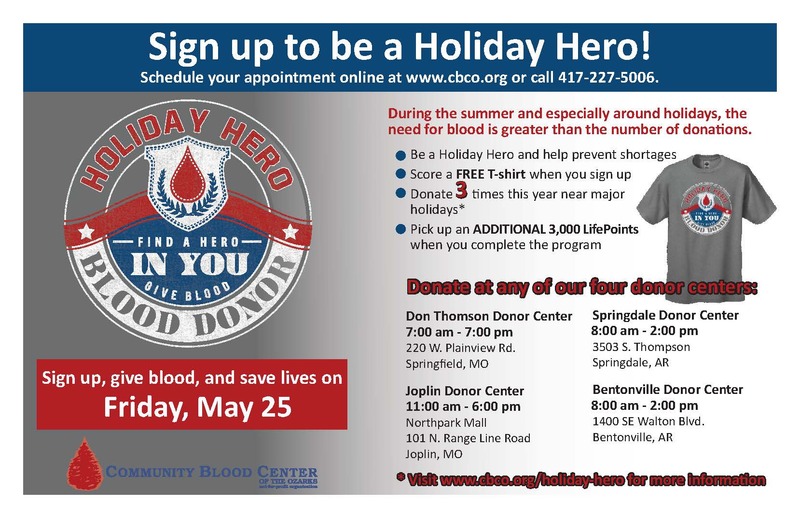 For future Holiday Heroes donations, choose a date and donor center from the list below and click to make your appointment online. Need help making your appointment? Call 417-227-5006. NOTE: This promotion is for whole blood donations made at our donor centers only. (Apheresis donors have other promotions and rewards specific to them.) If a donor gives a double red donation during either of the two sign-up periods and then gives again during the third round of dates, we will count that as three donations to complete the HOLIDAY HEROES program.